After getting no action in his first game, Gordon handled the first fly balls hit to him at his new position with relative ease. 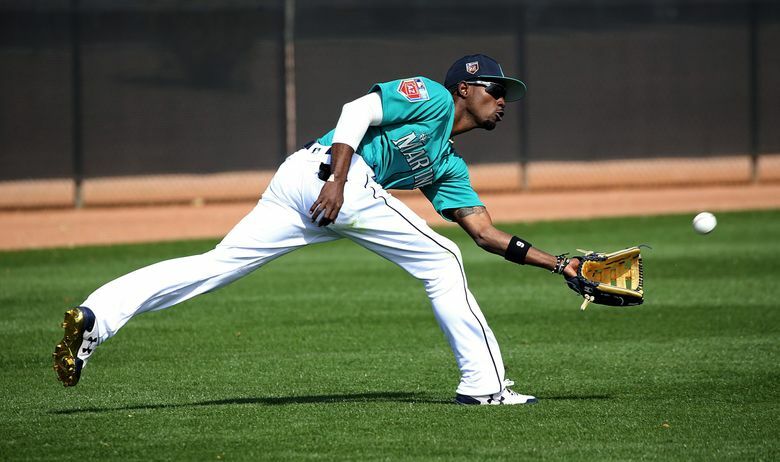 PEORIA, Ariz. — Dee Gordon had to show his gratitude. It was moment to cherish with the person who helped make it happen. Sure there was more than a hint of sarcasm to the display in front of the media and a few teammates. But it was still a relatively important moment for Gordon and the Mariners. Acquired in the offseason and asked to convert from second base to center field, Gordon has all the ability and talent to make such a change. He’s looked comfortable in all of the early workouts, but the unknown of making those plays in a game still lingered. “It’s different because if I drop it, then everybody knows I dropped it,” he said. While other veterans like Robinson Cano, Kyle Seager and Nelson Cruz are being purposefully delayed from appearing in spring training games, Gordon asked manager Scott Servais to play in several games early in the spring to get accustomed to game speed and action at his new position. “I needed to get out there and get my feet under me,” he said. Gordon started in the Cactus League opener on Friday and played three innings without having a single ball hit to him. But Leake and right-hander Chase De Jong gave him some opportunities a day later. The first came in the first inning with two out. Matt Davidson lofted a high fly into shallow center that Gordon tracked down with ease. He caught another flyout in the second inning and ran down a relatively well-struck drive to the warning track in deep right-center while looking completely at ease with the wall nearing. Servais wasn’t surprised that Gordon looked so instinctual in his reads and jumps on fly balls. Since finding out about the position switch, Gordon has put in hours of work to go with his advanced understanding of the game. Gordon hopes that the end of the conversion to center storyline will come as well. Well what about throwing from the outfield? Like it or not, the storyline may remain for a while. It’s rare that a Gold Glove performing infielder is asked to change to outfield at age 30. But the Mariners believe this will benefit him and them going forward. There will still be plenty of scrutiny of every detail of his defense going forward for a while. There are still so many more plays that he’s never experienced that he’ll need to make during a season.